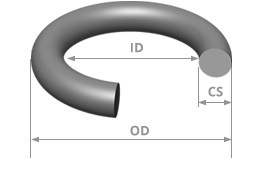 Use the metric o-ring size chart to find common metric o-ring sizes by cross section, inside diameter, and outside diameter. In addition to standard metric o-ring sizes, thousands of non-standard metric o-rings sizes are available in stock or can be custom-made within a few weeks, usually without additional tooling fees. Select your size in the metric o-ring size chart to easily order online from the world's largest o-ring inventory network.